Ramzzess has posted new development renders from the Boeing 757-200 for X-Plane in the X-Plane.org Forums. FlyThisSim has posted the first preview images from the upcoming Aspen Avionics Suite for X-Plane. VertigoStudios has posted more preview screenshots from the upcoming Grumman TBF Avenger for FSX. The first preview pictures from the upcoming Flight1 Cessna 182 TC for FSX have been posted here and here. 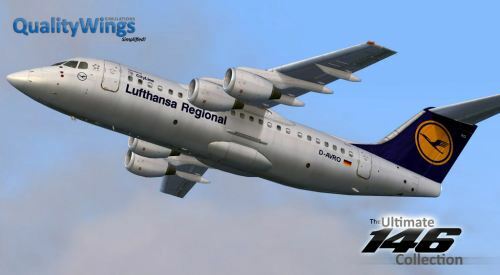 QualityWings has posted more livery previews from the upcoming BAe146/Avro RJ for FSX and FS2004. - parser error in RTM build causes over-sensitive rudder response: fixed. - reversed propeller blade visuals in IFR model: fixed. - Aux Tank fuel content corrected. - aileron and rudder pre trim removed. Aileron and rudder axes can now be trimmed with keyboard/controller commands. Some users experienced roll issues with certain controllers. For realistic experience it is however recommended to fly with neutral aileron and rudder trim. A2A Simulations has announced the "Captain of the Ship" Accu-Sim expansion to the Boeing 377 Stratocruiser for FSX. 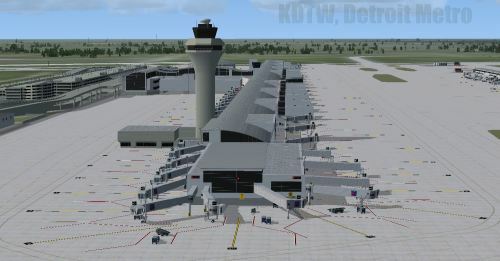 Blueprint Simulations has released Detroit Metropolitan Airport (KDTW) for FSX and FS2004 at SimMarket.  Trieng-Trieng is making us guess the next South African airport project under development for FSX. View images here. Nemeth Designs has posted new livery preview pictures from the upcoming Agusta A109 for FSX. 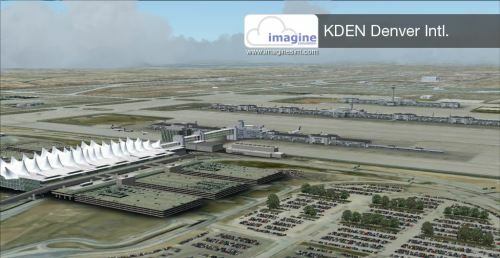 ImagineSim has announced the imminent release of Denver Intl. 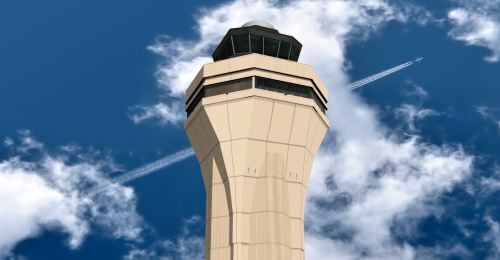 Airport (KDEN) Version 2 for FSX and FS2004. Aerosoft is offering 20% off all Mega Airport products, valid thru June 13th 2011. Details at the Aerosoft Website. The developer of the Learjet 23 for X-Plane has posted a video demonstrating the interactive cockpit on YouTube. The Take On Helicopters website has been updated with more information and new preview images. 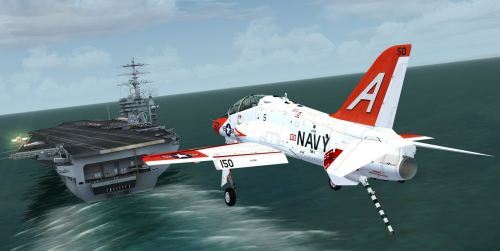 Dino Cattaneo has released a public beta of his freeware McDonnell Douglas T-45 Goshawk Version 2 for FSX. A_A Sceneries has released Samui International Aiport (VTSM) for FS2004. Details and purchase at SimMarket. Ground poly with high resolution texture for all the runway and taxiways including aprons. All the buildings were carefully modeled to simulate the real place including check in buildings, outdoor shopping mall, domestic and international gates, arrival area, clock tower. Moreover the surrounding garden was model as accurate as possible. You will fell like you are in the real place. Interior of the open-air gates was modeled too. Car park including 3d cars that are available in Thailand. Advertising billboards were modeled. Service vehicles were animated ones. Surrounding area was model in detail including the nearby Pier to Koh Pha Ngan, the bungalows near by the airports, Big Buddha stature, Wat on the hill near the airport (Wat Koa Hae Jug), etc. The whole island was modified to match the real thing. Coast line was corrected, new landclass was done, roads and rivers were drawn. The nearby islands and Surat thani provice were modified to be as real as possible. Almost a hundred islands were added. Much, much more to discover by yourself. LLH Créations has posted the first preview pictures from Annecy Meythet Airport (LFLP) for FSX in the LLH Forums. FSDreamTeam has posted new preview screenshots from Los Angeles Intl. Airport (KLAX) in the FSDT Forums. FranceVFR has released French Islands Photo HD for FSX. More information at the FranceVFR Website. Update: Now available for purchase at SimMarket. • High resolution photoreal scenery covering a French region. • 0.85 to 1 meter resolution ground texture made from aerial photography (IGN) retreated for an optimal visual rendition in FSX (summer only). • High resolution real 19 meter (LOD11) optimized custom mesh incuded. • All lakes and rivers have been entirely cut out and faithfully represented, reworked with bodies of landable water. • Water transparency effects for the whole scenery coverage. • Optional Waterclass and original water texture provided (depending on regions). • Extremely precise geo-referenced texture positionning is carried out in order to ensure a maximal compatibility with scenery add-ons for this region. • Process development is fully conform to the FSX SDK, ensuring a maximal compatibility with future versions of Flight Simulator. • Open scenery concept allows an easy integration of scenery add-ons from other editors. Flight1 has announced the 2011 open day at Shoreham Airport (EGKA) on Saturday, September 24th, 10AM to 5PM. 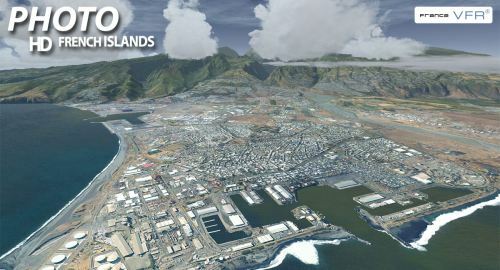 The freeware Marcq-en-Baoeul Airport (LFQO) for X-Plane has been released at the XPFR Website. 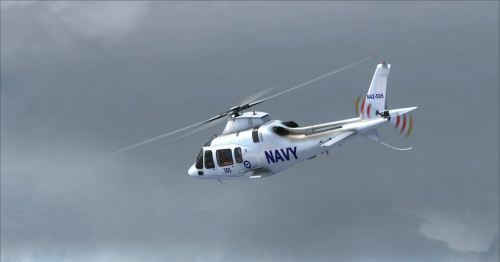 Bohemia Interactive has posted the Take On Helicopters E3 2011 Trailer on YouTube. Pacific Islands Simulation has posted more screenshots from Fua'amotu Intl. Airport (NFTF) for FSX in the PIS Forums. PMDG has posted several 2D cockpit panel preview pictures from the 737NGX for FSX on the PMDG Facebook Page. Orbx has posted some dusk previews from Port Maquarie Airport (YPMQ) version 3 for FSX in the Orbx Forums. New preview screenshots from Samui Intl. Aiport (VTSM) for FS2004 have been posted in the FSDeveloper Forums. Aerosoft has posted more preview pictures from the upcoming Vilnius X airport (EYVI) for FSX in the Aerosoft Forums. Premier Aircraft Design has released the freeware CASA C-295M/MP twin-turboprop military aircraft for FSX and FS2004. These Sale prices are valid until 9am on Monday 27th June. Virtavia has released the Boeing C-17 Globemaster III for FSX and FS2004. Details and purchase at the Virtavia Website. ArezOne-Aviation Soundstudios has released the Commander 114A SoundSet for FSX and FS2004 at SimMarket. Sonic Solutions has posted a preview video from the Nemeth Designs Agusta A109 Sound Pack for FSX. 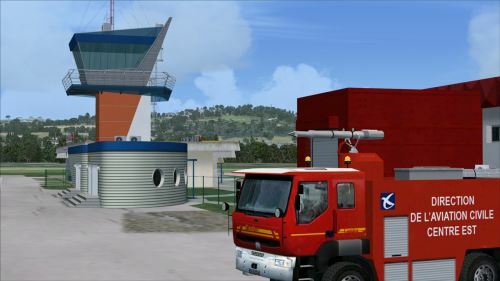 Trieng-Trieng has posted the first preview picture from the upcoming freeware Port St. Johns Airport (FAPJ) for FSX. Akesoft has posted more development pictures from the upcoming Foronda-X Airport (LEVT) for FSX and FS2004. 2, Delete unnesserary parts in fsx models. 3, Change afterburner control logics, avoid afterburner shapes appear when epu starting engine. Change logics for control engine smoke. 4, Change J-10 prototype cockpit shapes, delete HMD sensor shapes. 5, Add new J-10 prototype 1001 model (First Flight) with shaped color stripes and textures. 8, Reduce panel background bmps. 9, change gauges to support above upgrade. Fix "bingo warning flash always visible in MFD-Fuel Page after air-refuel" problem. thanks to CFSO4342 (flyingfish221) for this improve. correct G-limite in Flight model. 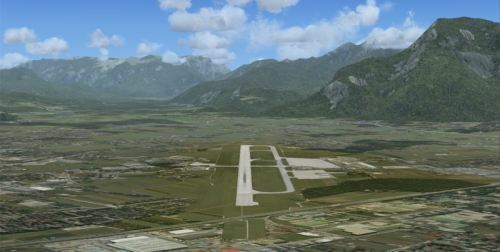 Gianni Design Team has posted the first screenshot from Salzburg Airport (LOWS) 2011 for FSX and FS2004. 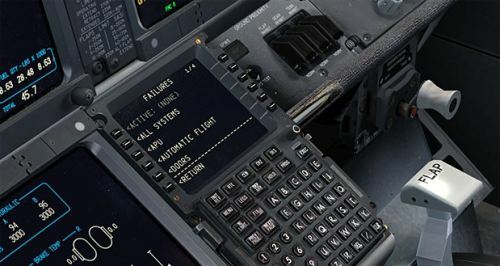 PMDG has posted an article on failure modelling and a cockpit customization video from the Boeing 737NGX for FSX. 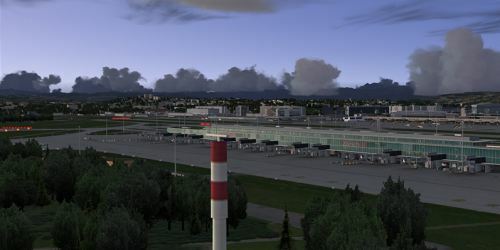 Aerosoft has posted new previews and the feature list from the upcoming Mega Airport Zurich (LSZH) for FSX and FS2004.